What use is a car without oil or a building that lacks a foundation? A farm without water and the right nutrients can’t possibly grow hearty crops. A child without their health cannot reach their full potential. This is why the Hastings Family YMCA participates in an annual nationwide event called Healthy Kids Day. Our three areas of focus “For Youth Development, For Healthy living, and For Social Responsibility” is what children will experience on Healthy Kids Day by being exposed to activities that stimulate the body and mind. These areas of focus are also tools that youth will use to further improve the community throughout their lives. The Hastings Family YMCA through Healthy Kids Day encourages the health and well-being of youth. 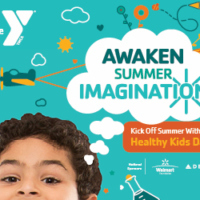 The Y has recruited other organizations in our community to set up booths to provide children with experiences that will encourage a healthy and active lifestyle. At Healthy Kids Day your child will have the opportunity to participate in many activities, including planting seeds to watch them grow, spending time with a neighborhood police officer and fireman, and learning about the Library’s Summer Reading Program, and many more. Kids will learn that being healthy is more than staying active and eating right; it means that a community can come together and help each other succeed and thrive. Research shows that kids are prone to gain more weight and fall behind in studies during the summer. Together we can shift the trend. This is the time for kids to get up, get out and grow. Participate in our national initiative to improve the health and well-being of kids.